The 2015-built AmaDara offers some of the most luxurious amenities available on river cruises along the exotic Mekong River between Cambodia and Vietnam. At 302 feet in length, AmaWaterways‘ new AmaDara features 62 staterooms, 14 being elegantly furnished suites accented with traditional touches for a river cruise experience that is as unique and sumptuous as the regions she sails. All staterooms aboard AmaDara feature both French and full step-out balconies. Photo courtesy of AmaWaterways. All staterooms aboard AmaDara are outside and staterooms and suites feature twin-balconies. All staterooms have a sitting area, writing desk, shower with bathrobe and slippers, a hairdryer, mini-bar, and an in-stateroom television. Sporting interior design that could best be described as a modern take on old world elegance, these staterooms are some of the nicest on the Mekong – period. 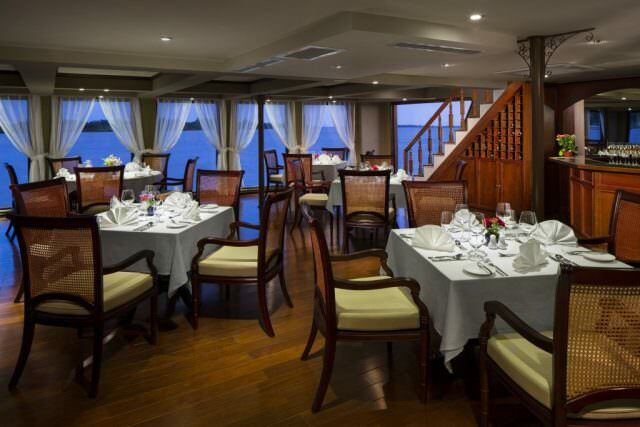 Category C staterooms are located on Tonle Deck and measure 251 square feet. They feature French and outside balconies and include all the amenities listed above. 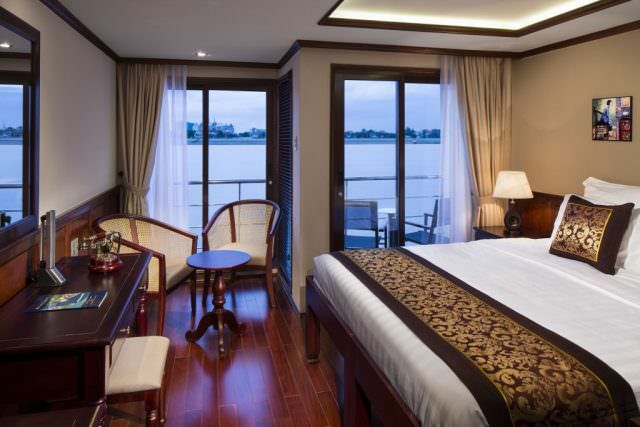 Category A & B staterooms are located on Saigon, Sadec, and Tonle decks. Like Category C staterooms, they are also 251 square feet with French and outside balconies. They include all of the amenities listed above. Located on Sadec Deck are the 12 Junior Suites. At 366 square feet, these rooms have French and outside balconies in addition to king-sized beds and bathrooms featuring separate tubs and showers. Two Luxury Suites located all the way forward on Sadec Deck provide 502 square feet of living space that features king-sized beds, bathrooms complete with whirlpool tubs and separate showers, and French and outside balconies with two lounge chairs and tables. 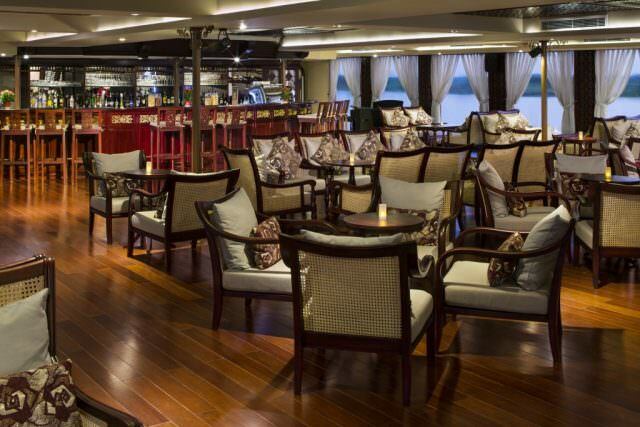 To ensure your cruise along the Mekong is as relaxing as it is enjoyable, AmaDara features a host of public rooms in which to pass the time. A full fitness center compliments the sun deck and swimming pool high atop Sadec Deck, and a comfortable lounge and bar area are located just one deck below. A forward facing lounge and library can also be found on this deck. There is also a reception area and gift shop, and a beautifully decorated Mekong Restaurant. AmaDara features a second restaurant, called The Chef’s Table Restaurant. There is no passenger elevator aboard AmaDara, which has four public decks. 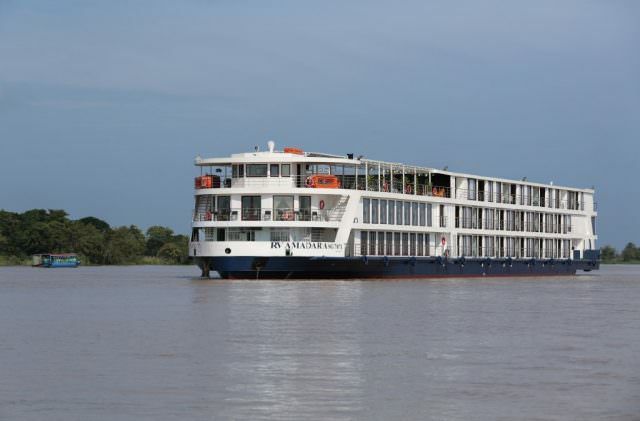 passengers will require both Vietnamese and Cambodian Visas for itineraries operated aboard AmaDara. AmaWaterways recommends brushing teeth with and drinking only from bottled water while onshore and aboard ship. Though water is purified and treated – and completely safe for bathing in – it may not be up to North American standards. The line provides unlimited, complimentary bottled water while onboard. Read other articles about the AmaDara. I was on AMAlotus in Jan 2012 and LOVED it.Would highly recommend for Vietnam and Cambodia.Rooms great,food good,shore excursions and hotels fantastic.Better for cruisers in good physical shape(lots of climbing,walking etc.). Glad to hear you had a great time aboard AmaLotus! I would like to begin by saying all of our tour guides were excellent as well as the Sofitel Hotels. I must also say that the bus transportation was very good and the drivers were truly amazing, I can’t believe they are able to get those large buses thru the streets and traffic…amazing! I just had a few concerns about our trip. 1) Illness on board the ship. This was not “tummy” problems but a virus with fever, coughing and sneezing. The passengers that had this virus were not confined and it spread thru the group rapidly. group that needed assistance and really should not have been on this part of our tour. 3) This is more of a recommendation about the day we left Ha Long Bay and flew to Cambodia. a chance to enjoy this evening, after talking with others they seemed to feel the same way. All in all this was a wonderful trip. Would I recommend it? Not too sure since the land portion was so good and the river part was so-so. I guess we were most disappointed with the amount of people that were sick on the ship and nothing really being addressed about it spreading, the food being just okay combined with people coughing and sneezing on it. The food just seemed repetitive and boring. I also feel there should be food available for a mid morning and afternoon snack. Chips in little bowls in the bar area (with people coughing/sneezing and then putting hands in dish) aren’t that appealing, as well as the cookies on the top deck in a container that is left open so flies are on them and then the lid is shut trapping flies on the cookies. So now not only are these cookies stale tasting but have flies on them as well. We kept telling ourselves this was an exotic trip so somethings I can accept. I really feel there should be a plan for passengers that have something contagious. Healthy passengers should not have to be exposed day after day. I also feel there should be some food options and mid morning and afternoon food available. 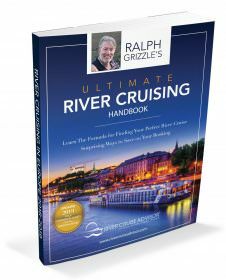 We were very surprised that there wasn’t anything available especially since the ship was moored mid stream we had no options. We traveled on the last Amalotus cruise of the Spring, 2012 season. I like the ship well enough but felt there was several things lacking. The rooms were nice HOWEVER, there is no where to store your luggage. The closet was adequate but did not fit the luggage. The beds are set off the floor only a couple of inches so it is impossible to put your suitcases under the bed. (Why not add risers to the bed? A couple of more inches would make a world of difference.) There is no drawers in the TV / Dresser area. This makes for a complicated luggage / clothing storage problem. The A/C worked well and the bathroom was nice. 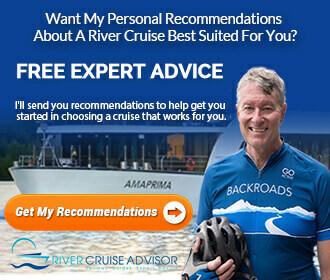 The cruise provides full meals but the meals were not very good – same thing day in and day out. There are no provisions to provide snacks / sandwiches / appetizers during the cruise. If you did not eat at the meal times you were totally out of luck. (Well, one could get a few potato chips at the bar or soggy cookies on the pool deck.) There was not much in the line of entertainment or lectures and I feel the cruise line should take the opportunity to enlighten the guests about ” all things South East Asia”. I’m surprised. My experience was just the opposite. We had no trouble with storage. And I don’t recall being hungry outside the mealtimes because of lack of snacks, but it’s been a year and a half so my memory may be hazy about that. I do remember the entertainment was good as were the educational components. Still, this is an open forum, so thanks for sharing your experience. Avidcruiser, you took La Marguerite, didn’t you? I think it was your review that lured me in! We’re booked on AMALotus – we tried to book La Marguerite, and all of our dates were “chartered”. AMALotus was supposed to be nearly identical, but as the reviews are starting to come back, it has become apparent it isn’t. The staterooms seem to be the biggest difference. The window seat is gone, the desk is just a table with no drawers, and the beds appear from passenger pictures to indeed be too close to the floor to stow luggage beneath. The closet looks small as well, and all that lovely woodwork is gone and the walls are white. There are also several mentions of faulty aircon and the water in the shower going from scalding to cold and back again frequently. That probably varies from cabin to cabin. There are also reports of growing pains with the food quality and service, but I assume that will work itself out by the time we go. It also appears that all the portions of the package that are identical to La Marguerite – the hotels, and the land portion – are as excellent as when you went.